My husband and I have a new obsession (no, I’m not talking about watching “Sherlock” on Netflix. . .but that is good). We can’t stop talking about StrengthsFinder. It started at his work when a new CEO suggested employees take the test. My husband’s results confirmed what we knew about his strengths and led to an internal job transfer. The new position maximizes his abilities and wiring, and makes us all very happy. Then my hubby insisted I take the test. Because, you see, I suffer from strength envy. I want to be all-the-people and good at all-the-things. So I strive to be better at planning ahead or staying on top of household chores or (insert thing I’m not really good at here). Turns out I spent most of my energy trying to grow my weaknesses, “my bottom 5”. The test revealed that out of 34 possible strengths, the strength “deliberate” landed at end of the list. I’m just not a planner. 1. Don’t read her book & get discouraged, because her strength isn’t yours. I realized there are lots and lots of books (& blogs) out there helping us be all-the-people and do all-the-things. For example, Suzy Sauce writes a book called, “Positive Moms make Perfect Kids”. You read the book, trying with all your might to be more positive, but soon realize it’s just working for you. And you feel like a failure. Here’s the deal, most likely “positivity” is top strength for Suzy, and not one for you. But you were drawn to the book because you wanted to grow in your weaknesses (not a terrible desire, but perhaps we’re wasting precious time & energy). Or Amanda Amazing writes about being more disciplined, scheduling your day or creating a meal plan or … but you would rather fly by the seat of your pants. Perhaps her strength is “discipline” and yours is “adaptability”. If you want to be the mom God made you to be, then embrace the good parts of you and thrive. If you worry about “her” and trying to maximize your weaknesses, then you will constantly feel defeat. 2. Don’t look at her actions with your strength-glasses. When you see a friend do something, don’t assume she’s doing it for the same reason you are. For example, there are two strengths in the list of 34–“achiever” and “competitor”. The results for both could be the same: hard work & accomplishments. But the goals differ: to get something done for yourself vs. to do better than her. One is working in competition with herself. The other is working in competition against everyone else. One can work hard in isolation. One accomplishes more when she sees the work of others. The problem happens when one mom (an achiever) throws a super-awesome, amazingly-themed, birthday party. . .because she loves it and she loves to out-do herself. But then her friend (a competitor) turns her nose up at the whole thing disgusted at how this person could work so hard to impress everyone. One mom may blog, podcast, speak, teach her kids because achieving and working hard is just her thing. Where another mom does all those things because she is a competitor and is driven by the desire to win. Same actions, different strengths, different motivations. 3. 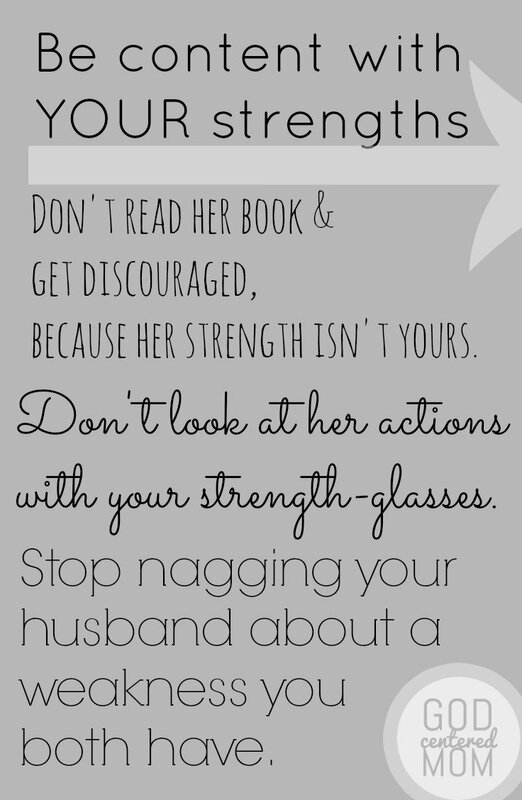 Stop nagging your husband about a weakness you both have. Believe it or not discovering my weaknesses and my husband’s weaknesses has helped our marriage. Because if I’m not a planner, then my husband needs to be. Right? For instance, if I see that family has a 5-step discipline plan, then I’m envious. And I’ll dedicate our next date night to forcing a conversation about planning. But when my husband announced “deliberate” is in his bottom 5, I realized we are just not going to be a family with a plan. And nagging him about being more deliberate won’t do much good (genius, right?). Do you know what is in both of our top 5? Woo. That’s right. We can “woo” the heck out of a crowd. We’re woo-ers. Instead of trying to be “planners” or “relators”, we need to embrace our “woo”ness. It’s no wonder we’d rather help lead a sunday school class for new church members than continue to lead a small group. We’re not shallow. We just get energized with the idea of unwrapping the treasure box of a new friendship. It’s not that we don’t have close friendships. We definitely like to have deep conversations and anchor friends, but you’ll also find us mingling at a large gathering making sure we “woo” our lil hearts out. I’m a big fan of knowing how God made you and making sure you use His gifts for His glory. StrengthsFinder has helped me focus my efforts not on bettering my weaknesses by maximizing my strengths. I also am a big fan of realizing God can be glorified in our weaknesses. Attempting a task which requires a skill set I don’t possess may be the right thing if God has called me to it. He was obviously a great writer (first 5 books of the Bible), yet made sure to tell God, “I’m slow of speech”. He questioned God, “Who am I to talk to Pharoah?”. When Moses wondered who he was, God didn’t puff him up and talk about Moses’ strengths. Nope. He reminded Moses He would be with him. And God made sure Moses knew who He was. Ultimately, my strengths & weaknesses don’t matter a hill a beans if the God of All-Strength is with me. Amen. Are you a “strength envier”? Do you know your own strengths? Or do you try to grow your weaknesses? I “think” if you buy the newest version of the book, “StrengthsFinder 2.0” it comes with a code for a free test listing your top 5 strengths. (click here for book link).